I have yet to adjust to West Coast time, so I’ve been waking at the crack of dawn. I try to fiddle around in VANilla for a while because it is in the low 40’s in the morning. I boil water for my coffee and oatmeal, do a little cleaning, feed my mutt, fill up my water bottles, and even do a little blogging though I can’t upload anything until I get to the only reliable 3G hot spot I’ve found within the park so far…parked next to a service road. Finally, around 8 am, Petey, VANilla, and I departed Jumbo Rocks and landed at the parking area of Ryan Mountain. The 2.8 mile round trip trail ascends 1,000 feet to the summit providing a panoramic view of the park. 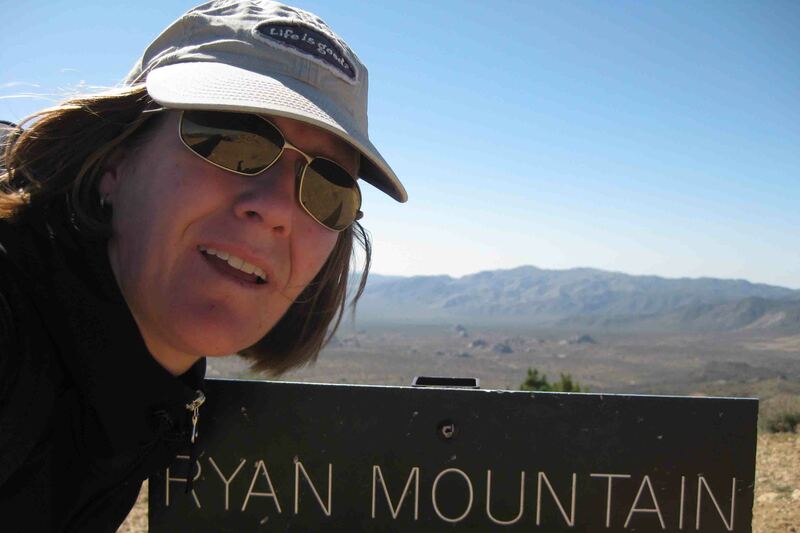 As the trail wound around the side of the mountain, the wind gusted so hard that I had to look down and to the left to keep my hat on my head. My right ear wasn’t very happy about it! I passed by a variety of rock formations strewn over the valley below, admired the blooming cacti, and gazed at the 10,831 foot Mt. San Jacinto that loomed above the Little San Bernardino Mountains, before I finally reached the 5,457 foot summit. Only four other brave souls shared the trail with me this early in the morning, but as I descended, it looked like others were preparing to make the climb. After my hike at Ryan Mountain, I took Petey for a stroll around the parking lot so he could water a few cacti. This became routine since he couldn’t join me on the trails. 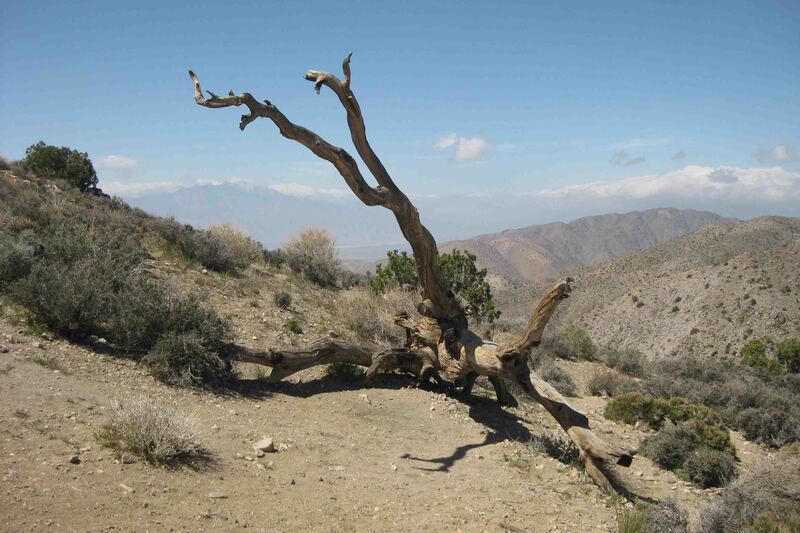 Before long, we continued farther south to Keys View, for a look at the Coachella Valley. 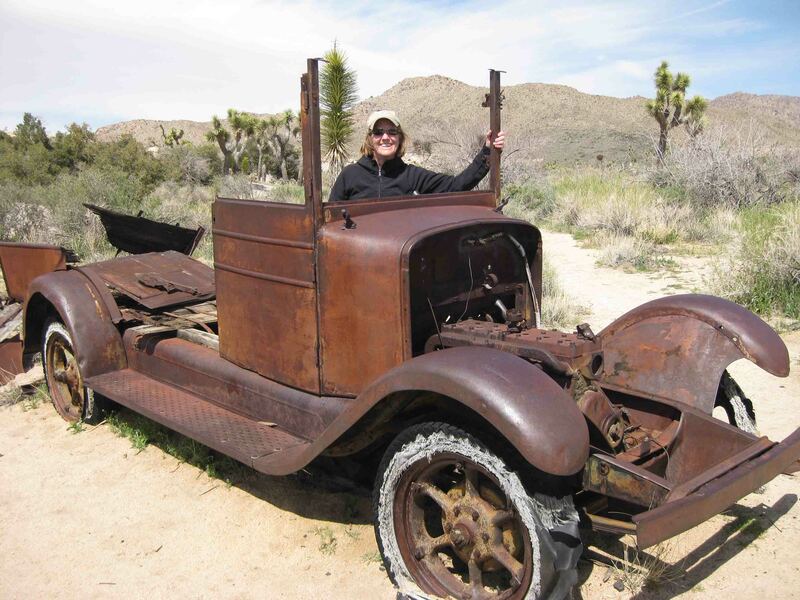 The valley is simply an extension of the Colorado Desert, though entrepreneurs at the turn of the 20th century began diverting water from the Colorado River to irrigate the land. Today, the valley is used to grow dates and citrus fruits. Given I had seen similar, yet prettier views without the population below, at Ryan Mountain, I thought the most interesting picture was of the dead tree next to VANilla. The four brave souls on Ryan Mountain, including two more of their friends, greeted me at the view. I wonder where they are headed next? 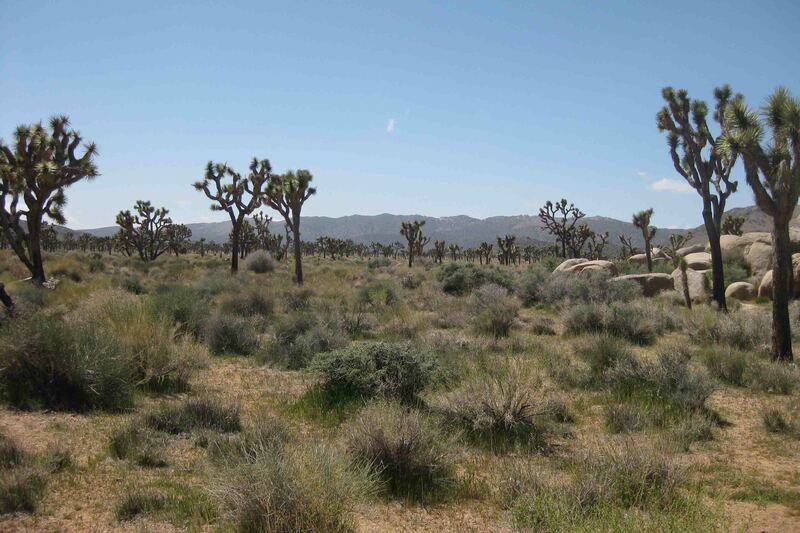 I decided to walk the short loop around Cap Rock, a picnic area with a nature trail that curved past large boulders, Joshua trees, and a variety of other desert plants such as the Desert Almond, the Galleta Grass, and the Mormon Tea that are able to survive harsh conditions of the Mojave Desert. 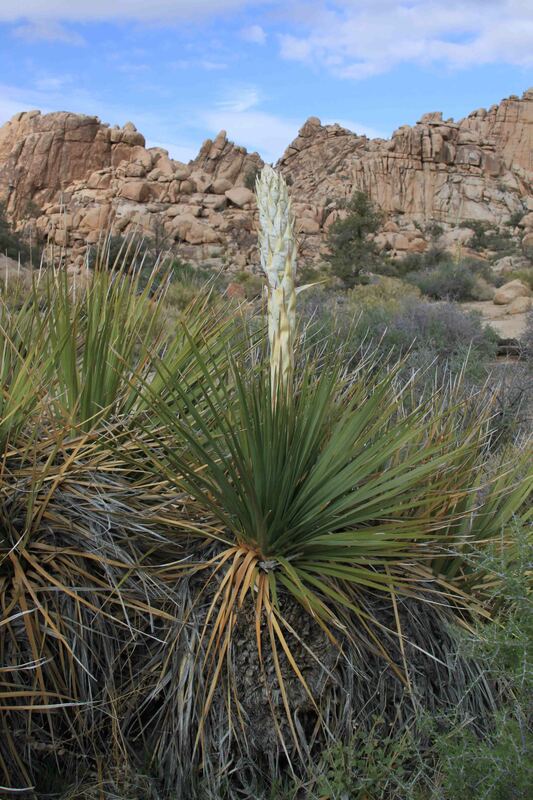 “The Mojave Desert, called by Mary Austin, ‘the land of little rain’, is located between the higher, colder Great Basin Desert and the lower, warmer Sonoran Desert.” This intermediate elevation brings hot summers and cold winters. It’s no wonder any plant could survive. 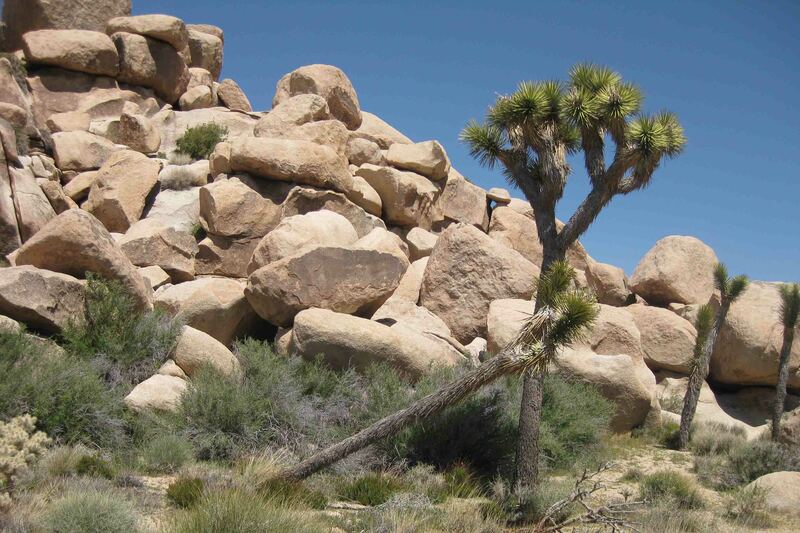 The Joshua Tree reproduces in two ways. 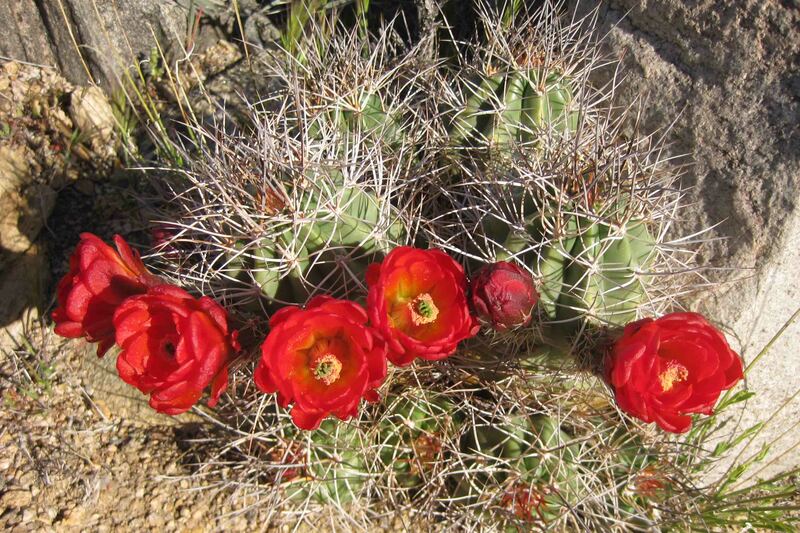 According to the posted sign, seeds produce tender seedlings that if they survive germinate under prickly “nurse” plants. The tree can also produce tough offshoots from underground runners resulting in a group of trees together. 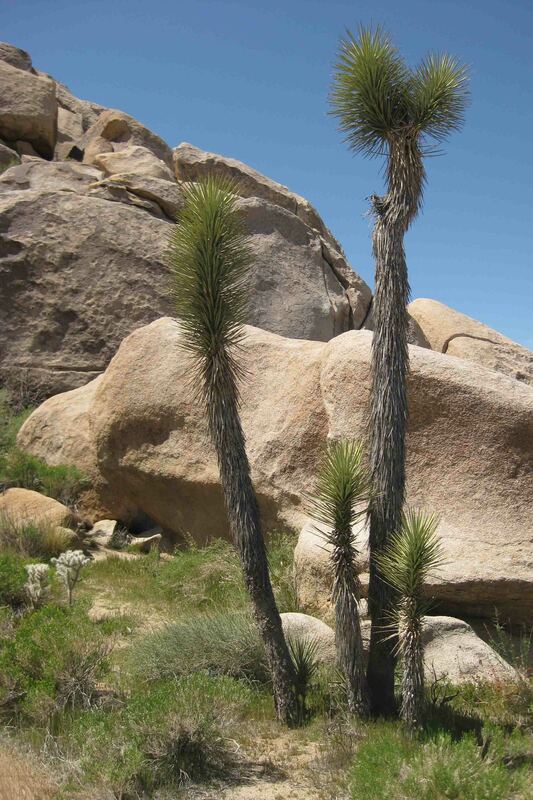 The Joshua Tree is home to a variety of desert animals including the yucca moth which pollinates its seeds, the loggerhead shrike which pierces its prey on the tree’s spine, the wood rat which builds its nest with discarded tree leaves, the spotted night snake that crawls among dead tree limbs in search of lizards, the Scott’s oriole which hangs its nest in protective leaf clusters, the ladder-backed woodpecker which pecks a hole in the trunk to nest, and the antelope ground squirrel that feeds on its seeds. Now I can see why the park is named for the tree given they can only be found in certain areas. I think I completed my first three stops before noon, or thereabouts, thus I turned north and took three more hikes around the Hidden Valley area. My first 2.2 mile trek through the desert to the Wall Street Mill, turned out to be closer to a 3.5 mile snaking ramble. This is where I met Doug and Lynn, from Rochester. 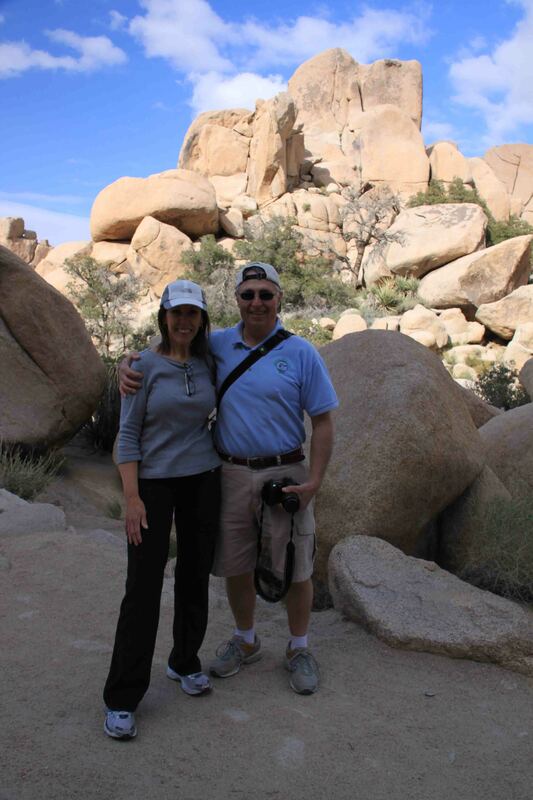 Doug, retired from Xerox, and Lynn, who still works for Xerox, were in Palm Springs for a corporate conference. They came a day early to do a little hiking. I hooked up with them because as I followed the path from the parking area, all of the sudden it turned into countless “less traveled options” that weaved through desert bush, and I didn’t want to get lost alone. None of us felt the trail was right, but it took us a while to reconnect with the wide path. No sooner than we found the wide path, did it fork again. We took the fork to some old ruins and wound around behind some large boulders to what seemed to be another dead end. 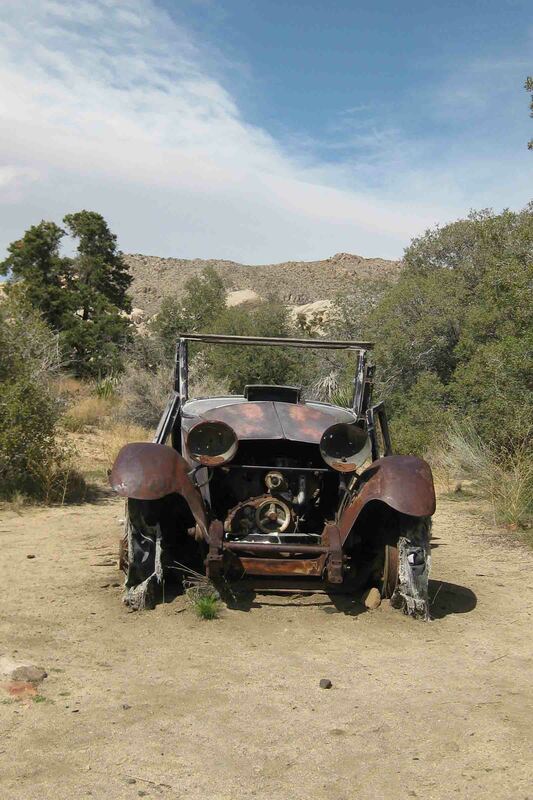 After retracing our steps, we made it to an old car rusted in the desert and then past an old windmill to some more bushes!!! We veered to the right a bit to find a stone marker commemorating the place where Bill Keys, the mill operator, shot Worth Bagley in self-defense over a property dispute. Keys spent five years in San Quentin before receiving a full pardon. From here we finally made it to the finest example of a gold processing mill in the park. 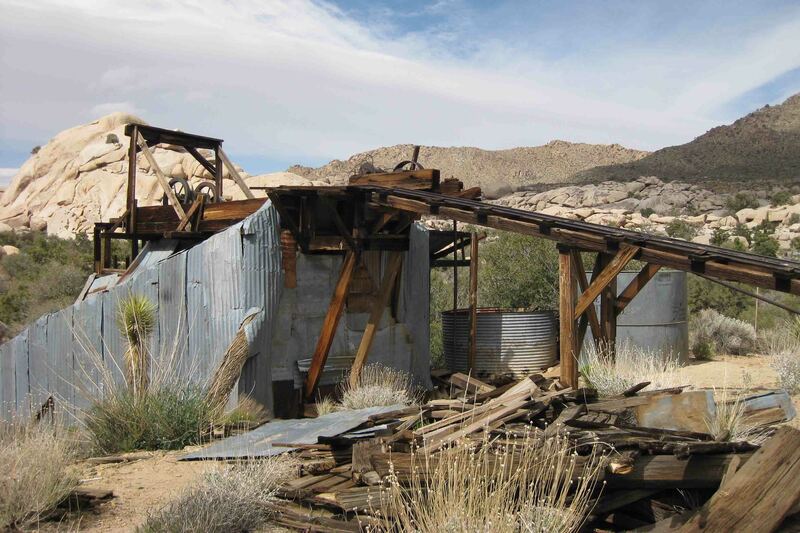 The two-stamp mill, the building that covers it, the well that supplied the water, and the well pump still remain. Keys bought the site in 1930, assembled his mill, and charged a fee to process ore for small-mine operators up until 1966. Returning from the mill, we still managed to stray from the main trail on occasion, but we finally arrived at the parking lot. We were all surprised to see how poorly marked this trail was as compared to all the others that have been quite simple, but regardless it was fun for me to wander around with them. Back at the parking lot, we split up. Doug and Lynn headed for the 1 mile Hidden Valley loop while I stayed in the vicinity to explore the 1.1 mile Barker Dam loop. 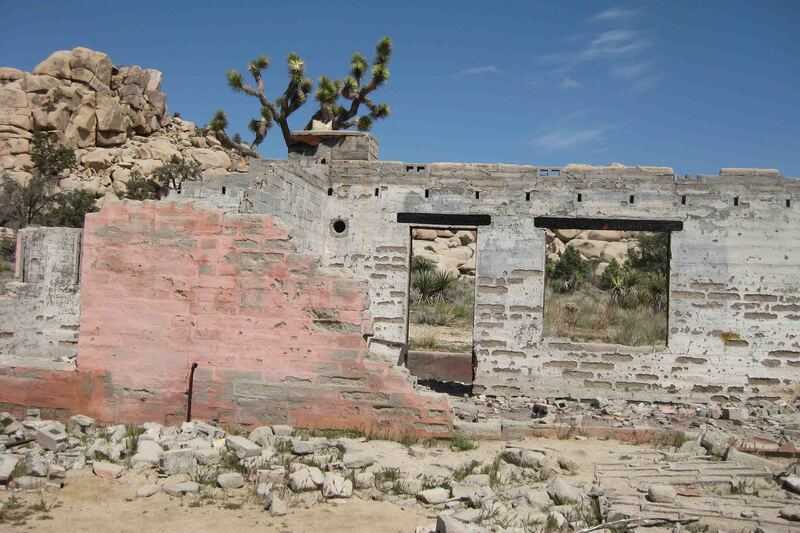 In the late 1800’s and early 1900’s when ranching was an important business here, an average of 10 inches of rain fell per year compared to the 2-5 inches the desert receives now. 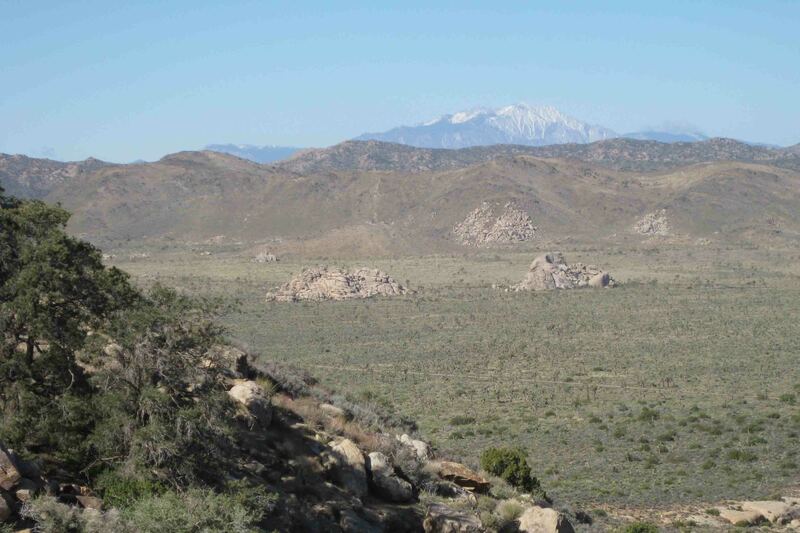 Grass ranges were lush and abundant in the valleys and water was critical to both ranchers and miners. 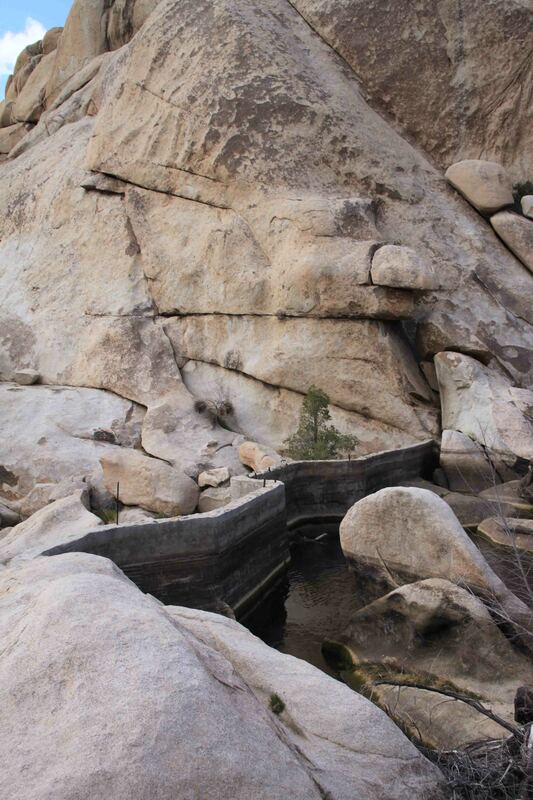 As such, the Barker & Shay Cattle Company built the dam in this natural basin to water their cattle. 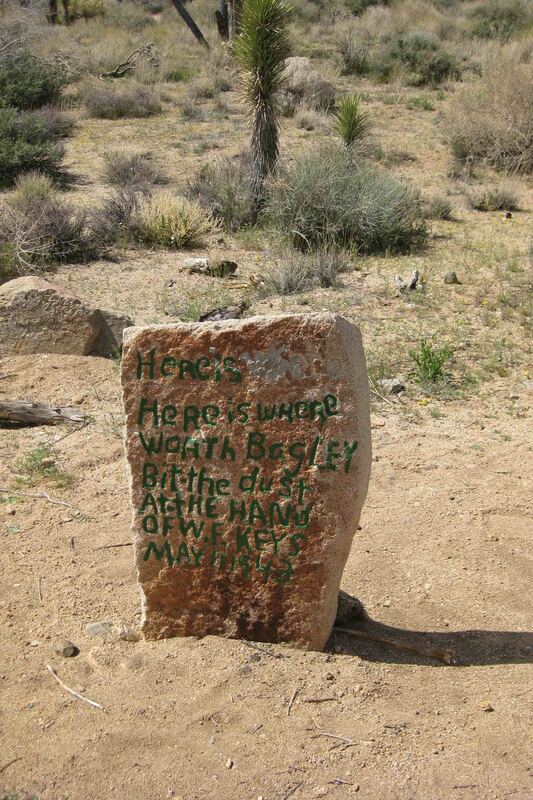 Bill Keys made later improvement to the dam. 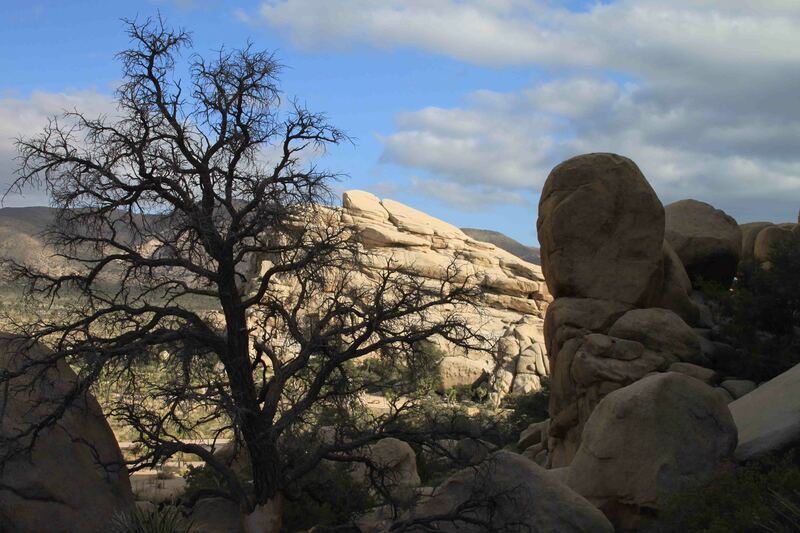 Also along this loop trail, hikers can find Indian petroglyphs carved into the stones. 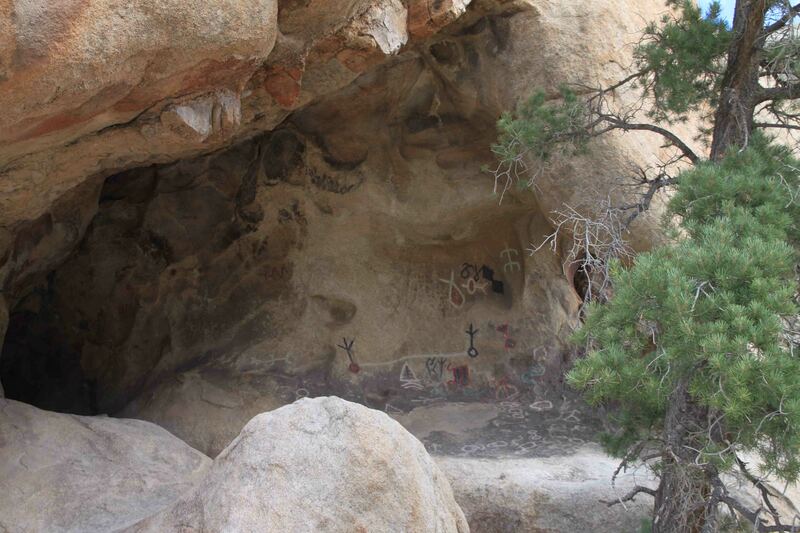 The Indian petroglyphs here have been vandalized by being traced over in paint. the desert. 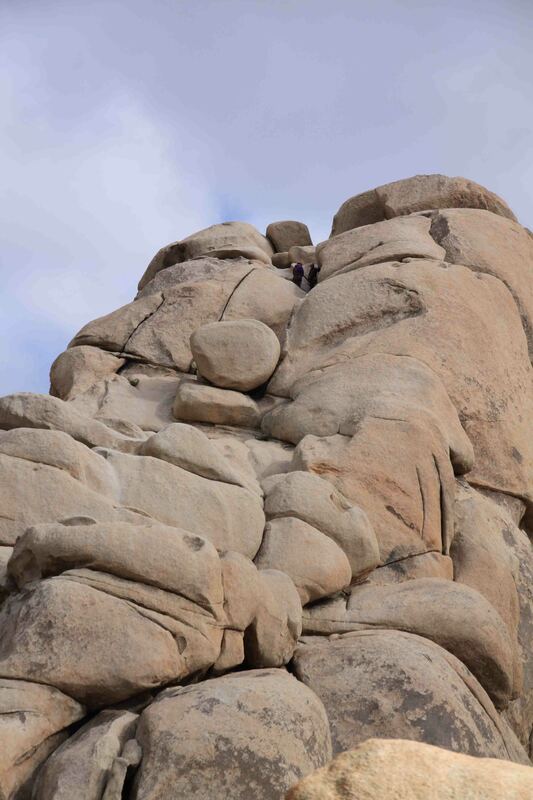 The surrounding rocks block the wind and collect moisture that help support a variety of plant and animal species. 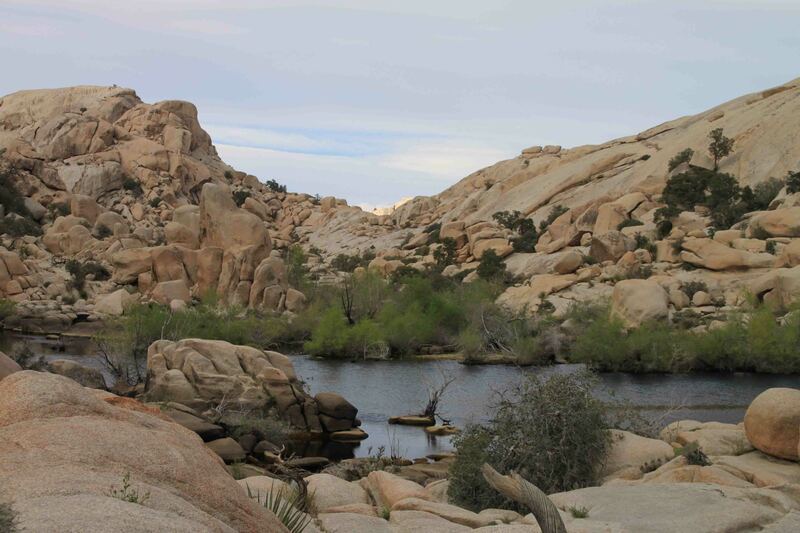 Hikers are able to skirt the trail through Hidden Valley because Bill Keys blasted an opening in the rocks just before Roosevelt declared Joshua Tree a national monument in 1936. Hanging on the rocks above the trail were climbers who were able to see the valley from a completely different perspective.